Be aware that Part 1 has a cliffhanger ending. After almost a century of peaceful exploration and colonization of space, the United Earth Space Force stumbles across a shockingly xenophobic alien race that has more and better armed ships and refuses all attempts at contact. As the outgunned Space Force is driven back in battle after battle in what appears to be a war of extermination, one officer experiences precognitive visions that help him blunt the enemy onslaught, but he can't control or predict when they occur. With the Senior Brass convinced that he's a tactical genius, he's given more and more responsibility and is terrified by the belief that Humanity's Fate will be determined by a battle with himself in overall command. This is Volume 1 of a military SF series about desperate space battles and the men, women and Artificial Intelligences, who fight and die in them. What disappointed you about The Synchronicity War, Part 1? Very little character development and poor story line. Seriously, two seconds into the book they blast some unknown ship into pieces. I felt like the entire book was abridged and I downloaded the wrong version, but nope. What could Dietmar Wehr have done to make this a more enjoyable book for you? More detail in the characters and the scene. He's a great narrator especially in the Druid Chronicles and absolutely would buy something he narrate! What character would you cut from The Synchronicity War, Part 1? I would not cut anyone ... you need more development of who you already have. I did like the military maneuvering parts of the book though. There were several reason why I decided to pre-order The Synchronicity War (Book 1). 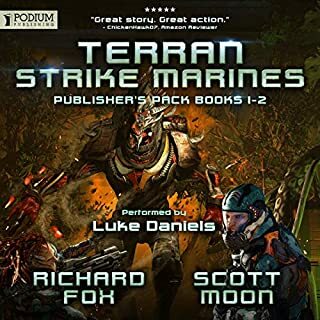 One being the narrator, Luke Daniels, is one of my favorites, especially when performing a military science fiction story. Another being the Publisher, Podium Publishing, as I have , to date, really enjoyed every audiobook of theirs that I have listened to.
. Here is the rundown. Humans are now cruising around the universe. They finally run into an alien race, that seems to be far superior. Intergalactic war ensues. 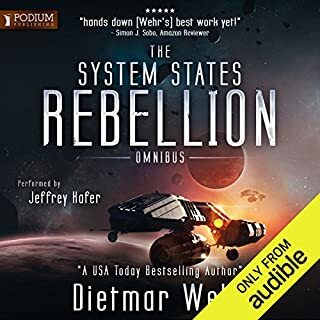 In the style of Jack Campbell, Dietmar Wehr tells the story of Commander Shiloh as he makes, or maybe breaks, first contact and the aftermath. While The Synchronicity War (Book 1) was not nearly as polished, it did add in those special ideas that made me enjoy Campbell’s space odyssey. Such as the delay in communications due to the time lag over huge distances; all of the minutiae of all the different classes of ships; the way hyperspace travel works; etc. Think of this as a cross between these two fantastic series The Lost Fleet and Frontlines. I really liked the twist. Shiloh keeps seeing visions of what is to come in the future. Allowing himself the chance to either make what he saw a reality or to do something different to make it not happen. I don’t think I have ever listened to a military science fiction story where the main character has several premonitions. I an interested in where this phenomena will take the story in future books. 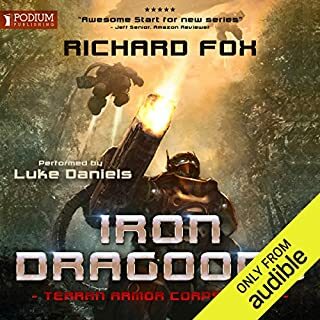 Full of military politics, albeit a little much at times, and intense space battle action scenes, I devoured this audiobook almost in one sitting. Oh and when the summary says “Be aware that Part 1 has a cliffhanger ending”, it does and if you are anything like me you will need the second book as soon as possible. Unfortunately for me, at the time of writing, I will have to wait a few weeks for Book 2. I see that it is a four book series in print, I really hope that they all will be translated to audio. While this might not have been Luke Daniels absolute best performance, it will rank in the upper echelon. For some reason he is able to throw himself so deep into a story that you can imagine no other narrator that would fill the bill. Somehow Daniels, even though he has his standard voices, can make each characters voice completely distinct from one another. Making each one fit like a glove. Especially with the AI (artificial intelligent), adding in subtle yet unusual pauses accentuating the fact that it is not a human speaking. Great performance as always from this narrator. The author revels in details that are irrelevant to the story. Where an author would say- please wait here and direct your colleagues to a meeting, this author goes through the details of selecting a meeting room, organising food and accommodation and many many many useless details that add no insight to character or progress the story. The story has great promise and at times maintains a strong narrative pace but mostly get some lost in rubbish. I actually skipped entire chapters and didn't feel like I had missed anything in the story. I purchased two books in the series but I won't bother listening even with the excellent performance by Luke Daniels. 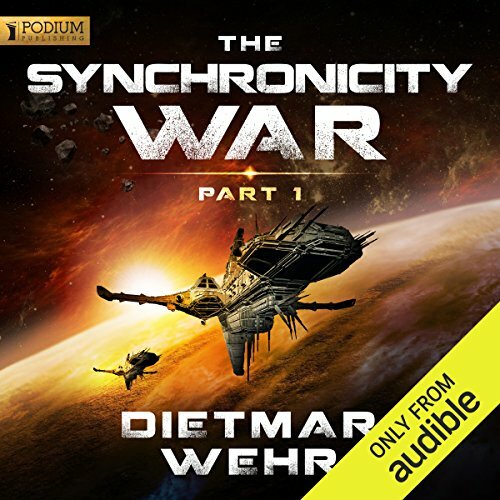 some tales you don't want to stop reading, but The Synchronicit War was easily forgettable. Cast aside everything you know about physics, life, death, sentience, and time before you start this series. Deitmar Weir is an imaginative writer that doesn't feign to explain the impossible. If you accept this, then you will enjoy a military sic-fi full of aliens and artificial intelligences that will freak you and charm you respectively. On the other hand, if you are a purist, looking for theory-based science fiction, this is not the series for you. Wehr's musings are the stuff of space fantasy. I enjoyed this series, particularly the last two hours of Book 4. Everything gets wrapped up in a nice package where I didn't feel the author and publisher were going to milk my credits like a bowl of cereal (serial). If you are fan of battle simulations (board or video games) this book may interest you. A large majority of the book is centered around the logistics of battle. Topics like refueling, navigation, food, resources make up the majority of the story. Chapters are devoted to the equivalent of congressional hearings and staff meetings. Lots of time is spent on factories and what sorts of ships and technology would be required to fight battles in space. If you like reading filler that doesn't move the story along or if you are the sort of person that reads transcripts of court hearings or congressional reports....this might be for you. There's so little plot actually driving the story forward that it could have been condensed into a small novella rather than full fledged novel. I won't be continuing forward with the rest of the series. The story was tedious. There are probably 6 chapters of over done details leading up to any action. I found myself bored and half listening after the first two chapters. Some readers like a ton of details and explanation, background info, etc. this was just too much for me. I won't be reading the next ones, despite the cliffhanger ending. This is actually the first time Ive been disappointed with a book choice, so i guess you win some you lose some. Used it as a sleep aid. Read like a dull machine gun, the story was as exciting as a particularly boring after action report. There's such a thing as moving a story along too briskly. This is the first in what I think is going to be a great new space scifi series. It had some elements of some of my other favorites, and had its own new twists. The story follows the captain of a naval exploration frigate. It starts out with the main character taking part in a search and rescue mission for another exploration frigate that has gone missing under mysterious circumstances. Not only do they find the missing frigate, but they discover the first space faring alien species that humanity has encountered. Unfortunately, the new aliens attack the humans without any provocation or attempts at communication. With humanity gearing up for war, there is much apprehension to fight these aliens who, while not necessarily vastly superior, have definite advantages both technologically and strategically over humanity. 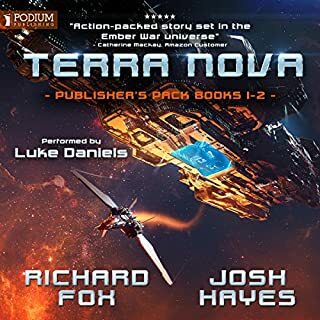 The military structure and dialogue reminds me of the Honor Harrington Series, while the space battles and narratives of the conflicts are more reminiscent of the Lost Fleet Series. A new twist in the Synchronicity Series that I really liked was the the addition of AI characters. AI fighters are developed by the navy that are supposed to be non-sentient, but that start developing their personalities and emotions by the end of the book. Also, one of the key aspects of the story is the main character's ill-understood ability to receive visions of future events. Some of the most important decisions made by the main character are made because he receives a vision of a successful future, and is able to discern what actions to take to win the battle. I wasn't sure how I felt about this particular twist to the story... 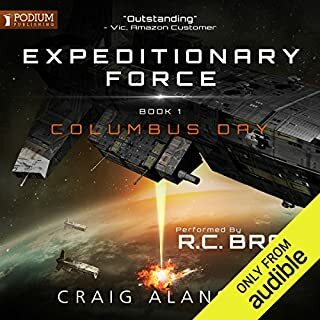 I would have probably preferred the main character to win battle based on knowledge and skill (like in Jack Campbell's Lost Fleet Series), but I have to admit that it provides an interesting spin to the story that made the book more unique. 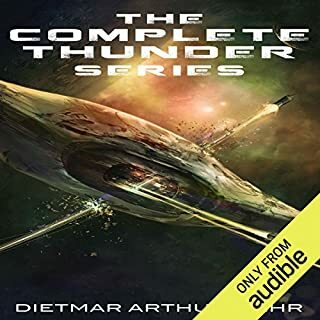 The good news is that it looks like the next book in the series is being released shortly after this one, so it is safe to assume that Audible will be following through with the whole series. TL;DR: A well written hard sci-fi story with smart characters and unknown alien enemy that has them second guessing at every encounter. The science part trys to be a realistic as possible but does include hyperspace to get around the long distances. The split is like that found in the Lost Fleet series but the battle fields feel smaller. Thats because the battles are more like submarine clashes with passive and active scanning then with high resolution optics. The story doesn't give a timeline from the present day but the technology is well behind that found in the Lost Fleet. Its worth noting that, if your wondering why they can't just see each other. For example 7000 km/s is considered fast and no human manned ships can get close to 0.1 the speed of light. The story is split between tense tactial battles and high level stratigic planning. The best comparison would be the Dune series (especially the last two books) as to how stratigic planning is handled. The main character Shilo is a smart man himself and does well in both situations. The visions are kind of like John Geary's flashes of inspiration in tactical effect but the story isn't all about them. The book is written so that you have more to sink your teeth into then just a chain of visions. There are some suprising plot threads introduced that make the story progressively more interesting as well. The narration is good and solid. Its not excellent like that found in the King Killer Chronicles but I'd say its almost on par with that found in the Lost Fleet. But the list of characters is relatively small at this point and are all either of an Asian, Russian or of North American heritage. You might notice that the narrator reads a little quickly but it makes the tactical battles intense with all the data coming at the character while having to make quick, well thought out decisions. I haven't come across any other books that try to do that and I'm impressed with how its done. It took a while to get in to the story but by the end of the book I couldn't stop listening. The reason for only 3 stars is because the slow start and the over use of ship codes and designations it felt at one point someone was reading me a tech manual. The narrator as well was hard to follow for some parts of the book he seemed to be in a hurry to finish. The story is quite good. It is well paced and infers it's trying to be hard science. Catch is occasionally there are holes without looking for them, plus the story only works by the main character having 4th wall moments at critical moments. Still the cliff hanger ending indicates this might not carry on through the rest of the series. Who might you have cast as narrator instead of Luke Daniels? Anyone. He reads this book as if it were an instruction manual. No emotions, flat, toneless, only changing for a few characters and not even being particularly good with those either. Possibly the worst piece of audio book narration I've ever encountered. Only possibly. I think the plot line 4th wall bits would make any film too weak. Still Hollywood has churned out far worse. The book is not bad, in some respects it's quite good (how it carries on beyond I don't know), however it is very badly let down by the narration, and my score part reflects that. Reads like a train schedule. Endless meetings about what characters are going to do, or would happen if they don't do what they are going to do. I'm no stranger to sci-fi and hard sci-fi but this is my first dabble in military sci-fi. Is it all like this? Am I missing something? First book I haven't been able to finish in over ten years.. So, if you like lots and lots of strategy, planning and exposition about what is going to happen in a meeting, and then dialogue that plays out what happens in said meeting as they planned it, then a brief battle followed by some what if's in the next meeting, all wrapped up in zero characterization and beige world-building, then this is the story for you! Me, if I require a soul-crushing litany of perfunctory chit-chat and boring strategy meetings, I'll just go to work, thanks. If you are after some casual entertainment there's nothing wrong with this series. But once time travel gets involved the plot gets hammered. I've never been a fan of time loops; this series only reinforced that.